Family living on the Marqual, the erstwhile canal passing through the old city, by bridging the banks. This photograph is part of the Macnabb Collection, and taken by Samuel Bourne in 1865, according to British Library that owns the picture. Ill planning and mismanagement of water resources, especially waterways, in Kashmir has lead to severe problems, turning some water bodies into cesspools, Ikhlaq Qadri reports. 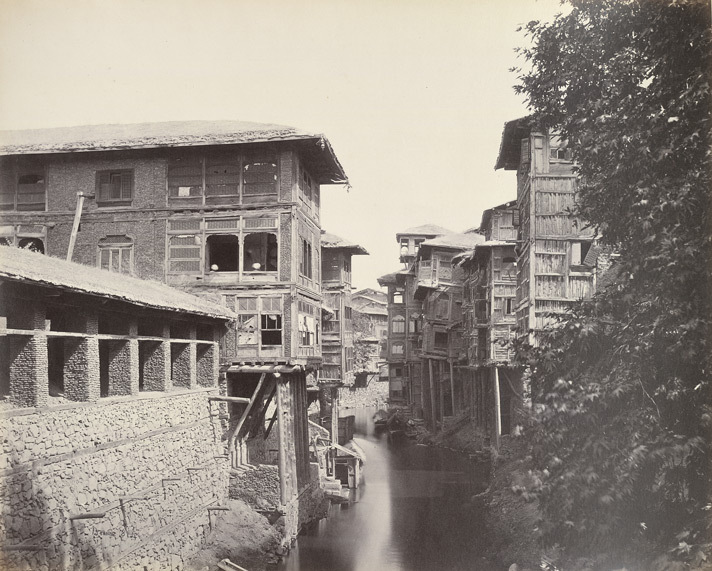 A major road in old town Srinagar was constructed by filling up a canal, Nallah Mar, traversing the city. The relatively wide road did provide connectivity but choked other water bodies connected to it. Decades later, the city is striving to recuperate from the loss of Nallah Mar. Once known as Venice of East, Srinagar had many streams crisscrossing the town and Nallah Mar was as important for it as a Jugular vein. The burial of Nallah Mar lead to stagnation of Brari Nambal lagoon and choked the world famous Dal Lake. Brari Nambal, which had clean fresh water, over the years turned into a stinking cesspool. Nallah Mar began from Brari Nambal lagoon and had two diversions. One passed through Eidgah into Khushalsar, Gilsar and finally emptied into Anchar lake and, other through Noor Bagh into the River Jehlum. Nallah Mar, in earlier times, was always busy with activities. “When I was young, I have witnessed the movement of Shikaras and light houseboats carrying passengers and goods (through Nallah Mar),” remembers Dr. Abdul Majeed Kak, Research Co-coordinator at the Islamia College of science and Commerce, Srinagar. The stream was built during the reign of Sultan Zain-ul-Abidin popularly known as Budshah in 14th Century. Till 1970’s Mar was living with all glory but what researchers term as the greed of people and callousness of authorities it started to get deteriorated to the level that it never was revived. “With political support the residential houses and business establishments were constructed on two flanks of Nallah Mar that led to its choking,” says Kak. 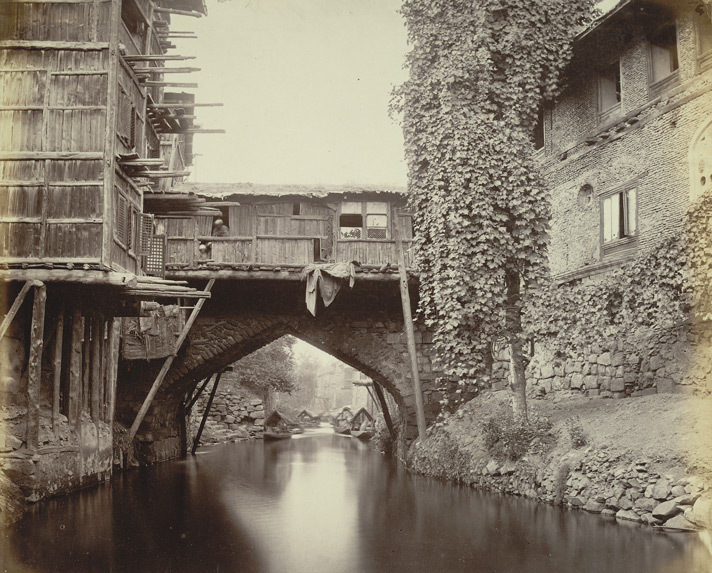 The photograph taken by Samuel Bourne in the 1860s, shows the Marqual of Srinagar surviving with the population, clean and flowing. The photograph is part of the British Library collection on Kashmir. The unattended Mar started to stink after which authorities decided to fill it up instead of getting it revived. “In GM Sadiq’s regime the Mar was left to stink and then in 1975 business of filling was done by Sheikh Muhammad Abdullah,” noted Kashmiri Poet and chairman valley citizens council Zareef Ahmad Zareef said. Many bridges were laid over the stream including, Nowpora Kadal, Naid Kadal, Bohri Kadal, Saraf Kadal, Kaid Kadal, Rajouri Kadal, Kaw daer Kadal, or Pachi Kadal, Dumbi Kadal,Taribal, Narwar (Buti Kadal),” Zareef counted. The historians blamed that the Nallah Mar lost its existence to the political rivalry resulting Kashmir to lose an important heritage. “To disturb a particular group of people and engage them in (keep them busy with) other things Nallah Mar was filled up. The only thing that actually happened was, we lost our heritage,” said historian Fida Muhammad Hasnain. The engineers are also displeased with filling up Nallah Mar. “The additional road space was the only benefit but the price we paid a huge price in the shape of lost heritage besides economic, social and ecological loss,” said architect Sameer Hamdani.